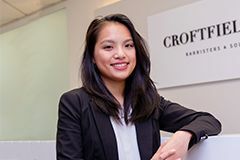 She loves the challenges and variety of her law career, says Bachelor of Laws alumna Samantha Hiew who now works for Croftfield Law. “I enjoy the challenge of learning something new every day, and the detail in preparing commercial agreements to protect clients and their personal or commercial interests. The reputation of the AUT Law School attracted her to AUT, Samantha says. It’s a decision Samantha hasn’t regretted. The wide range of activities law students can participate in was the highlight of her studies, says Samantha who graduated earlier this year. Another highlight for her was being able to practise her skills during the many competitions for law students.